HSC Blues earned the Avante Garde Interclub Championship title. They narrowly defeated hosting Avant Garde for the trophy. 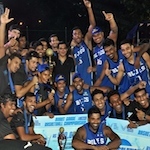 Mithila Abeysekara came up with 18 points to pace the winners. He was trumped the MVP of the tournament. The teams were tied at 30 at the interval. However HSC Blues managed to prevail in a tight contest late in regulation. Phillip Parrel stepped up with 27 points for Avant Garde.